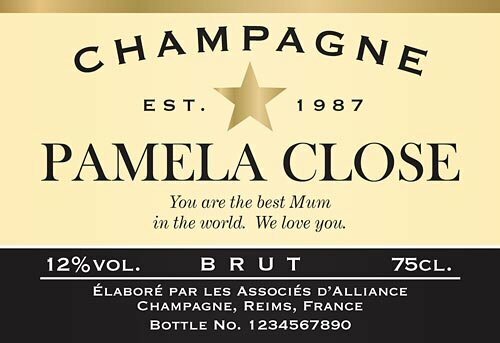 Our personalised bottle of Champagne makes a unique and wonderful gift. 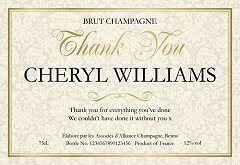 Whoever the recipient, personalised Champagne makes a great way to say Thank You. Not only can you personalise these bottles with the recipient's name and special message, you can also choose from a range of superb label designs, specially created for any occasion and recipient. 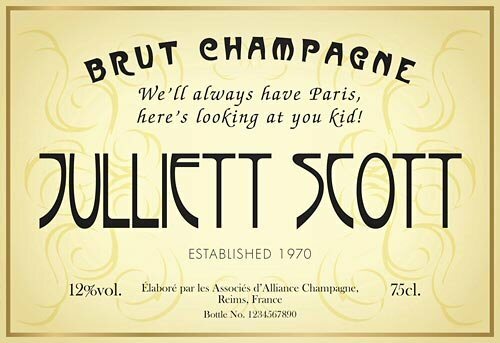 We have selected a light, fresh, vigorously youthful Champagne with a fine, elegant, slightly lemony nose, lively mousse and long crisp palate. Outstanding value and consistently good. There is a high percentage of Pinot grapes (both Noir and Meunier) in the blend. Our labels are printed using the highest quality waterproof inks and water resistant paper stocks and are highly resistant to scratching. 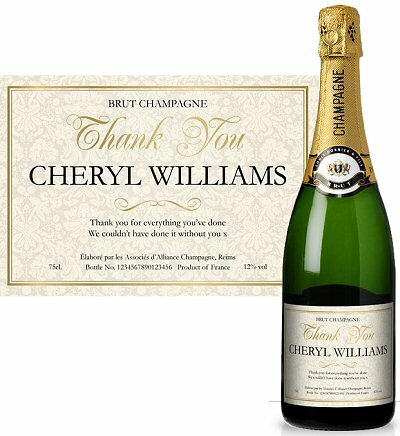 Note: while we are able to take orders for UK and European Union orders, we are currently unable to ship alcohol-related products outside the EU at the present time. Firstly, select one of the label styles shown below, using the select box above. You can ENLARGE a label by clicking on it. Person's name or names which will appear on the label. You can either put one name (eg "Scott Thomas") or two names (eg "Rachel & Anthony"). There is a limit of 25 characters for the name(s) part of the label. Special message (max 80 characters, 2 lines). You can specify whether you wish to choose our 48 hour Express delivery option. Standard delivery is usually 3-4 days. While we are able to take orders for UK and European Union orders, we are currently unable to ship alcohol-related products outside the EU at the present time.